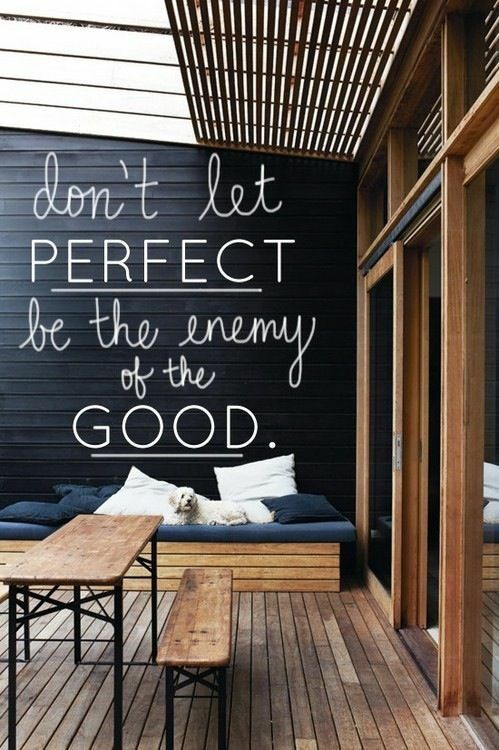 one of my biggest struggles is definitely letting perfect be the enemy of good, or even 'good enough'. (a concept started by voltaire, i don't just make quotes up, thought i'd like to let you believe i'm just that creative.) i've always had the mindset of "if it can't be done perfectly, why bother doing it at all?" and i generally just don't start anything i know i can't finish perfectly or master 100% on the first try. if i can't answer all my e-mails, i don't even get to any of them. if i can't get all the cleaning done in one day, i won't even start. if i can't completely follow a budget, i don't make one at all. it's a very all or nothing approach that i seem to have adopted. and this fact is becoming increasingly apparent as i've decided to eat better and work out more. (i want my rewards! and to win the diet bet!) i'm absolutely terrible when it comes to this. yes, i should buy fresh vegetables and cook them myself. but i won't, so instead of just getting frozen vegetables, i order pizza. i should work out every day, some sort of cardio down in the gym, but when i don't, i figure i might as well get a cab to work instead of walking. it's some weird anti-motivation thing going on in my brain - that if i ruined part of the day, i may as well go whole hog for the rest of it. if the day can't be flawless, it might as well be downright awful and ending with a bowl of ice cream sitting on the couch watching a netflix marathon. again. i'm really determined to change that; to accept 'good enough' and not just perfect. (not entirely perfect? ha, i'm so funny.) i'm trying to make september my 'no fast food or ordering in' month. and it's already a struggle and it's day 2. obviously perfect would be getting all fresh items weekly or bi-weekly at the grocery store that is 20 feet from my front door and cooking well rounded meals every night with only healthy ingredients. but for me, it's just not realistic. i have to keep reminding myself that while i may not be making perfect sautéed, salt and preservative free paleo approved vegetables every night, at least heating up frozen broccoli and using a little butter is better than stopping at taco bell on the way home. i'm not sure why it's so hard for my brain to grasp that concept, but i do this regularly. there's a lot of excuse making going on in my head. i can convince myself of anything, i'm really an excellent arguer. but eating partially healthy is better than not trying at all. working out occasionally is better than just sitting on the couch. even if it's not the absolutely best i'm capable of, something is better than nothing. now, if only my real life would catch up to my blog wisdom. Ugh I completely know how you feel - I think a lot of people do actually. Just know you're not alone and :) Recognizing that perfect is sometimes the enemy of good is half the problem of letting it go! Yup! Whenever I "start over" on a diet (every 2 days), my diet has to be PERFECT. If there's a day where I "accidentally" ate something I wasn't supposed to, that day was SHOT. And then I let myself binge on everything. We have faith! You can do it! I only start over on Mondays or 1st of the months, so I'll just considering the whole week a wash if I mess up on a Wednesday. Terrible habit! I could not agree more, girlfriend!! Amen to it all! Ps I'm thinking about starting for football season... You interested? If you are, check out my blog and help me spread the word! i will let you in on a little secret: what you're going through is totally normal. changing your lifestyle is hard because you're trying to establish new habits and break away from old ones; that's why you're having a hard time. it's like that for anyone who tries to create new habits and eating better/exercising is something that is new to your routine and let's face it - we all are resistant to change! BUT that doesn't mean it's forever. another secret: it takes humans on average, 4-6wks to establish new habits. this means you need to do this every day around the same time for 4 consecutive weeks and only then will it become routine. workout every day at the same time and pretty soon, you'll NEED to workout at that time otherwise your day will feel off. eat (healthy) at the same times every day to train your body to feel hungry at those times. also remember: take baby steps. if your goal for september is to not order takeout, ONLY WORK ON THAT and then cross that off your list. don't worry about not working out every day - you'll get to that goal in due time but taking BABY STEPS IS KEY to successfully changing your lifestyle because if you tackle too much at once, it'll be too overwhelming and then you'll just quit and go back to old ways (trust me, i'm a master at that!!). when you take baby steps, you accomplish more goals and the more goals you accomplish, the more secure you are in creating your habits which will then spur you to tackle MORE goals! see the positive cycle? so just tackle your one goal for september. getting healthy is 80% clean eating and 20% exercise so you're tackling the hard part already!! I'm with you on the eating out less and eating healthier! It is hard, but it should get easier if we stick with it! Self sabotage! I've been a victim of this. It's hard to not throw the whole day in the toilet after eating cookies at lunch, but I really try not to. I'm the same way. If it's not perfect then I don't wanna. Please tell your asos ad to stop showing me all these cute clothes. Anyway...you can do this girl. Frozen is better than nothing. Good for you! And this a great quote to remember. I am really trying hard to stay on track diet wise, and you're right, we may not do things perfectly, but putting in effort is a great step in itself! I have the exact same problem especially with eating better and working out. I call it my sabotage button, as soon as I think I can't do something perfectly or exactly as it should be I just give up and go the complete opposite. I wish I had suggestions but since I am working on it I can't haha just to say I feel your pain! So very true! I'm a bit the same way with my work. I always feel like if there's something I can't do perfectly it's best I don't do it. But that's not right! Very lovely post! god this post is the story of my life! especially when it comes to diet. I feel like I finally got over this after years and years and am really hoping it sticks! I went through the exact same thing and the only thing that knocked me out of it was that I was "training" for a half marathon that I was supposed to run with a group raising money for charity. Once I'd raised all of this money and had all of these people asking me why I wasn't attending group runs I had to force myself to make a compromise -- no I could not run a 9 minute mile, no I could not get myself to eat 100% healthy awesome food all the time and I could not for the life of me give up ice cream, buuut if I could eat LESS ice cream and run an 11 minute mile...well that was better than nothing if I had to run this race! That was over a year ago and it has mostly stuck with me. Maybe the diet bet will be what knocks you into the right groove! guuuuurl....can I just say...I don't quite get the not being perfect being the enemy of the good quote...I think Voltaire is just a little too Voltaire-y for me. but the rest of your post I'm reading like the Bible. soooooo true (not that I read the Bible on the reg, but I think you get what I'm laying down). So....I love where you're going w. this and I should clearly never comment drunk. sorry for the confusion. i've decided that the moment i think it's a good idea to eat something terrible i'm going to tweet you and you're going to virtually knock the idea from my brain. you may do the same should you need the help. It's harder than it seems, in practice! I really need to embrace this more. Baby steps. You and me both girlfriend. I need to implement this too.